An inside look at how Facebook is battling everyone from Google to Elizabeth Warren while trying to protect its core business. Mark Zuckerberg wants to talk about how Facebook is changing. A month later it becomes apparent that Zuckerberg has been rehearsing his lines, the tech-mogul equivalent of a comedian trying out material at open-mic night. In a much-heralded post on Facebook in early March, Zuckerberg announced his company would build new privacy-friendly messaging products, moving from a “town square” approach to one more akin to a living room conversation. “People should have simple, intimate places where they have clear control over who can communicate with them and confidence that no one else can access what they share,” he wrote. In other words, they should have a place to communicate that is nothing like Facebook. Change is a complicated topic for Facebook. On the one hand, it certainly is doing a ton to address its problems, like hiring tens of thousands of workers to police its content. Yet on the other hand, for the foreseeable future, Facebook will remain exactly what it has been over the past decade-plus of its meteoric rise: a publishing platform that gathers data on its 2.3 billion users for the benefit of its marketer customers, who helped Facebook record $56 billion in revenues last year. Facebook may be changing, but it aims to preserve what it’s got until it figures out a way to replace the business too much change would jeopardize. Facebook’s fiddling with its business model is also more pressing than many realize—and not merely a response to the scrutiny the company faces. Facebook’s core business is slowing dramatically, even as a combination of potentially hamstringing regulation and rejuvenated competition looms. Its flagship product, widely known as Facebook Blue, is losing popularity, especially among younger audiences. And user growth has slowed in the rich countries where the company makes the bulk of its money. Sure, Facebook’s 2018 revenues grew at a torrid pace for a company its size, gaining 37%. But that reflects a rapidly declining growth rate, from 54% in 2016 and 47% in 2017. Wall Street projects continued deceleration, to 23% this year and 21% in 2020, according to S&P Global. Mike Schroepfer, Facebook’s chief technology officer, is pointing to two side-by-side images on his laptop, asking me to identify the “good” from the “bad.” The answer isn’t obvious. Both pictures look convincingly cannabis-like—dense, leafy-green buds that are coated with miniature, hair-like growths, or perhaps mold. Finally, I make a semi-educated guess: “The one on the left is marijuana?” Schroepfer nods approvingly. NOT STANDING STILL: Mark Zuckerberg (center) at the European Parliament in Brussels in May 2018. People are as much a part of Facebook’s solutions to its problems as computers. It has tripled its number of content moderators, contractors it hires to monitor postings in Facebook’s News Feed section, from 10,000 in 2017 to 30,000 today. At the higher end of the organizational chart, Facebook also has beefed up the hiring and redeploying of experts who address specific issues with the information its users see. Molly Cutler, Facebook’s former associate general counsel, now leads a “strategic response” team that meets weekly with chief operating officer Sheryl Sandberg. Samidh Chakrabarti, the company’s head of civic engagement, has shifted his focus from voter registration to preventing election interference. Facebook has reassigned engineers in its once separate “safety and security” group to be embedded in individual product teams. Such fixes are real, yet they are designed to improve Facebook, not to fundamentally change it. Removing terrorist propaganda is a crowd pleaser, argues Gene Munster, a veteran analyst with Loup Ventures, especially compared with the thornier issue of what Facebook does with its users’ data. “They like talking about that because it’s fixable,” he says. The geographic mix is just one macro issue buffeting Facebook’s business. Its newer enterprises, including Instagram (purchased in 2012 for $1 billion) and WhatsApp (acquired for $22 billion in 2014) haven’t yet translated into big revenue opportunities, though ­Instagram has been growing rapidly. Whats­App, in particular, has huge global reach—it has 1.5 billion users worldwide but no obvious business model. What began as Facebook.com, the original Facebook, has become positively becalmed. “The majority of growth is coming from Instagram, with core Facebook revenue growth likely to hit high single digits sometime next year,” Stifel analyst Scott Devitt writes to clients. He says other Internet companies make for better investments. In 2012, Usama Fayyad enlisted two French Ph.D.s in an ambitious project. Their task was to figure out just how accurately Facebook could determine an individual user’s purchasing behavior, based on the data available to the growing Silicon Valley company, which had about a billion users at the time. He made himself the subject of the study. In the years since Fayyad’s study, Facebook’s ability to target customers has only improved as its data sources have grown. Much of that additional data has come from Facebook itself, via new features like Facebook Live, its live-streaming video service, or the launch of Reactions, a more nuanced version of the Like button that allows users to express love, sadness, anger, and other emotional responses to content on the platform. (The videos that users watch and their reactions to all sorts of content can tell marketers a lot about who they are.) But the company also accumulated all sorts of other data sources from third-party providers eager to share the spoils. Facebook proved unable to control how the mix of third-party information and its own data got used, such as when political researcher Cambridge Analytica violated Facebook’s rules, the company says, to harvest and act on Facebook user profiles. CONTENT COP: Mike Schroepfer, Facebook’s chief technology officer, onstage at Facebook’s F8 developers conference in San Jose in 2017. Facebook is deploying artificial intelligence to help root out unwanted content from its sites. The changes have hurt­­­­—but have not crippled—the effectiveness of Facebook’s ads because there are ways clever ad-tech specialists can combine Facebook’s data with third-party data. “As these changes took place, we had to renavigate a little bit,” says Laura Joukovski, chief media officer at TechStyle Fashion Group, an online retailer. Facebook believes one way to improve trust on the part of users is to help them better understand Facebook itself. The theory is that if consumers understand how ads work, they’ll continue to view them as a positive aspect of the Facebook experience. “Consumers—and it’s not their fault—do not understand how digital advertising works,” says Carolyn Everson, vice president of global marketing solutions. One of the ways Facebook is trying to shed light on its advertising model is by letting users click on individual ads to find out why they’re being put in front of them. But the “Why am I seeing this?” button doesn’t go into much detail, providing cursory information such as suggesting a retailer wants to reach people of a certain age in a given location. Facebook says it is still working out the kinks to the “Why am I seeing this?” feature and is in the process of allowing for much greater transparency and data controls. For example, it has announced it will offer a Clear History button that gives users the ability to erase their activity, much as web browser software has allowed for years. The tweaks add up to just enough changes, more grist for the argument that Facebook is adapting—but only as little as possible. If Facebook does change in more fundamental ways, it will be because it has to, not because it wants to. In 2020, the first-ever state data-privacy law will take effect in California, unless Congress can hurriedly pass a law to preempt it nationwide. The so-called California Consumer Privacy Act (CCPA) is one of the most stringent sets of rules that could soon put unprecedented restrictions on Facebook and companies like it. The law would give consumers much more control over their data, allowing them to see what online information is being collected on them and how it’s being used. They’ll also be able to hit “delete” on their online information—a kind of Clear History button but for the entire Internet. Newsom’s proposal is a “data dividend” that would require Internet companies to pay users for use of their information, and he’s not the only one supporting it. Some, like Democratic 2020 presidential candidate Elizabeth Warren, are calling for companies like Facebook to be broken up. At this point, Facebook’s best hope is that federal regulations come together faster than state-led laws, as the Internet industry hopes the fed rules will end up being more lenient. Either way, the upcoming restrictions will have a lasting impact on Facebook. The company is already seeing the repercussions of the European Union’s General Data Protection Regulation (GDPR). The new laws aim to give European consumers more control over their online information, requiring companies to gain consent from users before utilizing certain types of data. Failure to comply can result in fines up to 4% of a company’s annual revenue—more than $2 billion, in Facebook’s case. Even worse, the laws can cut into the company’s ability to sell targeted ads. “With GDPR,” says Sandberg, “there’s a percentage of people in Europe that have opted out of certain kinds of targeting. Those ads are going to be less relevant.” In other words, the Internet industry, including Facebook, already is taking a financial hit there. Regulation won’t kick in overnight, but already competitors are capitalizing on Facebook’s vulnerabilities. For the first time, it has viable rivals in addition to arch-nemesis Google. 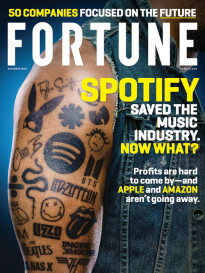 There’s Amazon, which has incomparable purchasing behavior data on its customers, and TikTok, the music-video app that recently passed 1 billion downloads, many by customers much younger than Facebook’s ­aging users. (Popularity with youngsters brings baggage: The Federal Trade Commission recently fined TikTok $5.7 million for violating child privacy laws.) All of this adds up to a strange new world for Facebook: There is unprecedented scrutiny on its slowing yet money­making core product and more obstacles than ever before to innovating quickly. WE HEAR YOU: Sheryl Sandberg during a U.S. Senate Select Committee on Intelligence hearing on foreign influences in social media in September 2018. The discussion of Facebook’s travails often toggles back to its past travails and what a canny, wise-beyond-his-years operator Mark Zuckerberg repeatedly has proved to be. He resisted early calls to sell his company. (Yahoo offered $1 billion in 2006.) He weathered user outrage over various design changes. In 2012 he successfully converted Facebook from a desktop-PC web program to a mobile app, a feat that required a complete retooling of its development process. Facebook has already circled the globe looking for users. It has saturated the markets that are most profitable for the company, and now it needs to turn to additional ways of making money. If the future is in private messages or pictures that auto-delete, then Facebook wants to be there too. “I’ve always tried to run the company in a way that we’re willing to take on more costs or lower revenue … in order to get to what I think will be the better thing over time,” he says, previewing the painful changes the company’s new products will require. “But I just think getting to the right model over time is going to help build a stronger community.” Make no mistake. Zuckerberg doesn’t just mean stronger for users, or society, or lawmakers. He means stronger for Facebook.